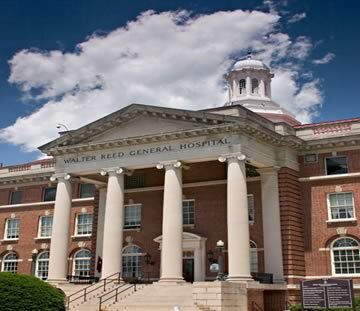 On May 1, 1909, Walter Reed General Hospital officially opened its doors for the first time to patients. Ten patients were admitted to the U.S. Army’s first named permanent general hospital. Walter Reed only included what would be called “Building 1” — the one structure for administration, 65 to 80 beds for inpatient care, and two double sets of sergeant’s quarters. 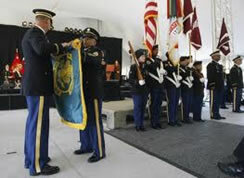 On July 27, 2011, a closing ceremony was held to celebrate the history of Walter Reed Army Medical Center, and the transition into the next century of warrior care. 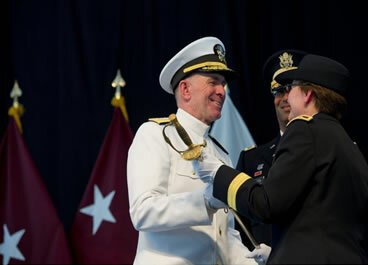 Major General Carla Hawley-Bowland, commanding general, Northern Regional Medical Command and WRAMC, hosted the ceremony, which included a number of distinguished guest speakers. The Walter Reed Army Medical Center colors were cased during this ceremony. A flag casing ceremony is a formal event where the colors, or flag, of the unit are taken down and put into a protective covering. The colors casing ceremony symbolically signifies the end of the unit. Army Secretary John McHugh said Walter Reed has never been about bricks and mortar, but about "spirit and hope and compassion" that will continue after the hospital closed. "These doors may close, the address may change, but the name, the legacy and most importantly the work and the healing will endure," McHugh said. The Walter Reed National Military Medical Center will have a 340-bed capacity and will be run by all branches of the military, not just the Army. The ceremony also included the uncasing of the new Army element colors for the WRNMMC Bethesda and FBCH facilities. Major General Hawley-Bowland passes Major Walter Reed’s saber, used at many Walter Reed ceremonies, to Rear Admiral Matthew Nathan, commander of the National Naval Medical Center in Bethesda, future home to the new Walter Reed National Military Medical Center (WRNMMC). Rear Admiral Nathan will be the first commander of the new WRNMMC at Bethesda. The sword transfer at Wednesday's ceremony made official the transition.